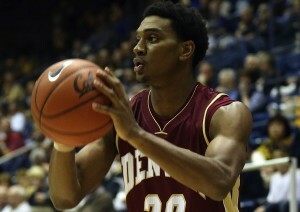 DENVER – The University of Denver men’s basketball team erased a 12-point second half deficit as they rallied to a 73-66 victory over the Oral Roberts Golden Eagles Wednesday night at Magness Arena. With the Pioneers (9-10, 3-3 Summit League) trailing the Golden Eagles 65-53 (10-9, 4-2 Summit League) with 6:59 remaining in the second half, Denver went on an incredible 20-1 run to close out the game. The Crimson and Gold got seven points apiece from Nate Engesser (Colorado Springs, Colo.) and Jalen Love (Wichita, Kan.) during the run. Denver had all eight players who appeared in the game score six or more points led by Engesser’s 18. For the second straight game the Pios out-rebounded (23-20) their opponent and moved to 5-0 on the season when they win the rebounding battle. Denver’s bench came up big outscoring Oral Roberts 24-17 led by Marcus Byrd (Highlands Ranch, Colo.) who scored 11 points and grabbed three rebounds off the bench. Christian Mackey (Kirtland, N.M) tied his career-high with seven points, while Bryant Rucker (Frisco, Texas) scored six points knocking down both of his 3-point attempts. Brett Olson (Highlands Ranch, Colo.) filled up the stat sheet with nine points, seven assists and grabbed four rebounds. Daniel Amigo (El Paso, Texas) scored seven points and set career-highs with four rebounds and three assists. Duke Douglas (New Orleans, La.) made his first career start and scored six points and grabbed two rebounds. Love finished the game with nine points. Denver outscored Oral Roberts 41-28 in the final 20 minutes. The Pioneers finished the game with 17 assists on 23 made field goals. Denver finished the game shooting 52.3 percent (23-of-44), while Oral Roberts shot 61.0 percent (25-of-41). The Pioneers shot 52.9 percent from behind the 3-point line (9-of-17). The Golden Eagles shot 42.9 percent (6-of-14) from 3-point range. The Crimson and Gold finished the game shooting 85.7 percent (18-of-21) from the free-throw line. The opening half featured Oral Roberts shooting an incredible 73.7 percent (14-of-19) from the field. The Pioneers spent the first half in foul trouble with Love and Amigo both picking up three first half fouls. The Golden Eagles led 38-32 at halftime. Both teams held first half leads, with the Pioneers biggest lead being four points and Oral Roberts’ being six. Denver was led by Olson who had seven points and five assists in the first half. Engesser dropped in eight points. Oral Roberts was led by Denell Henderson who scored 14 points. The Crimson and Gold had 10 assists on 12 made field goals in the first half. Denver shot 52.2 percent (12-of-23) from the floor in the opening 20 minutes. The Pioneers hit for 45.5 percent (5-of-11) from behind the arc in the first half. The Golden Eagles shot 50.0 percent (4-of-8) from behind the 3-point line. Oral Roberts was led by Henderson who scored 18 points and grabbed four rebounds. Notes: Cam Griffin (San Antonio, Texas) missed Wednesday’s game as he was suspended for a violation of team standards. Olson moved into eighth place on the Pioneers all-time assist chart. Olson currently sits with 304 career assists. Denver will head on a three-game Summit League road trip with the first game of the trip at Omaha on Saturday, Jan. 24 at 12 p.m. MT. The game can be heard on Mile High Sports Radio AM 1550 FM 94.1|96.9 in Boulder.